United Methodist members and leaders, global health innovators and an “American Idol” star took the stage today to celebrate the success of Imagine No Malaria, an initiative of the people of The United Methodist Church aimed at ending malaria deaths. The multimedia event, which was held at the denomination’s quadrennial legislative gathering being held through May 20 at the Oregon Convention Center, also marked the official kick off of The Abundant Health: Our Promise to Children campaign. 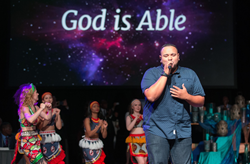 "American Idol" star Jeremy Rosado performs "Able" at the United Methodist's Imagine No Malaria celebration and Abundant Health launch. Today has been an incredible celebration of what God has done through the unified effort of the people of The United Methodist Church. The 12-minute celebration, a collaboration between United Methodist Communications and the General Board of Global Ministries (GBGM), featured a highlights video of the grassroots campaign that has engaged donors of all ages, showcased the impact of the initiative on the continent of Africa and debuted “Able,” a song commissioned by Imagine No Malaria as a gift to United Methodists across the globe. Jeremy Rosado, a Top 12 contestant on Season 11 of “American Idol,” performed the song to more than 1,000 people attending the event. The song is available as a free download at Amazon Music and the Imagine No Malaria website, as well as on YouTube. Church leadership was joined onstage at the celebration by Christoph Benn, director of External Relations at the Global Fund to Fight AIDS, Tuberculosis and Malaria in Geneva. In 2010, the Global Fund and Imagine No Malaria joined forces in the fight against malaria. Today, The United Methodist Church is one of the most significant non-government donors to the Global Fund and is unique within the global community of faith-based organizations. To-date, the people of The United Methodist Church have raised more than $68 million to end malaria deaths in Sub-Saharan Africa, where one child dies from malaria every two minutes. The Imagine No Malaria campaign aims to raise $75 million to address the impact of malaria in Africa through prevention, treatment, communication and education. Building on the success of Imagine No Malaria, the Abundant Health program seeks to engage at least 10,000 U.S. churches in programs that encourage promoting physical activities, healthy diet and nutrition, education for tobacco- and drug-free living and mental health education. "We've imagined no malaria; now let us imagine abundant health," said Thomas Kemper, general secretary of GBGM. "A lack of abundant health is not only when you are sick," said Dr. Olusimbo Ige, executive director of GBGM's Global Health program. "It can also mean that your potential for good health is not fully realized. We want to connect with every child in every place, and we are calling on every church and every individual to join us in this effort." As a celebration memento, each General Conference delegate took home a flash drive containing the song "Able" and Abundant Health materials.